If you are considering joining an organization like Overeaters Anonymous or Compulsive Eaters Anonymous to help you control binge eating, read this article first. It will help you avoid crucial mistakes that could keep you stuck in food addiction for years and show you how to stop binge eating disorder permanently. Overeaters Anonymous, Alcoholic Anonymous, Love Addicts Anonymous, and the likes all rely on a method called the twelve step program. I personally am not a big fan of these programs. I once joined a program for love addiction and co-dependency. Even though I could see the real benefits to it, I think there is actually a right way and a wrong way to use them; and I think most people are going about it the wrong way. The support can actually be restrictive; you can find yourself so reliant on the support of others that you can’t stop binge eating on your own. That’s why many simply never leave their support group. Whether you’re already in a support group or considering joining one, I’ll give you insight on how to use best the twelve step program to overcome binge eating. Twelve step programs should just that: twelve steps—not 24 or 36 or 120. I was often told that you have to do the program several times to really get better. Some of the women in my groups had been there for many years. I didn’t feel like staying that long, and I don’t think you should either. There are several great benefits to Overeaters Anonymous and similar twelve step programs. A major one is that they can help you become aware of how your addiction works, and what causes binge eating sprees. But in order to gain a deeper understanding of your addiction you must do your best to really listen to what others are saying. Most people who fail these programs are the ones just waiting for their turn to speak. It’s OK to feel restless at times. I remember my own impatience. But, really try to be present to what people are saying and overextend your loving care to them. You will gain several benefits through doing that: a new ability to simultaneously listen to others and be present to yourself and also the ability to look at yourself with love and listen with care. Groups usually tell you to sit quietly during others’ speaking time, but they rarely stress enough the incredible benefits of listening to others with empathy and genuine interest. It’s really building a skill you can use for the rest of your life either with your inner child or others. To say “I am a binge eater” in front of an audience may be great if you have dwelt in denial of your condition for years. But after that denial has been removed, to keep saying “I am an addict” actually becomes toxic. If you have read my article, “Why You Can’t Stop Binge Eating,” you already know that I used the power of “I am” to stop feeling like buying a pack of cigarettes each time I walked past the drugstore. I just said “I am a nonsmoker” and tried to focus on a feeling of joy and pride. A sentence without any emotional context won’t work. I would focus more on the joy of a positive outlook than on my desire for a cigarette. Within 30 days, I could walk by the drugstore and not even feel the faintest trigger. 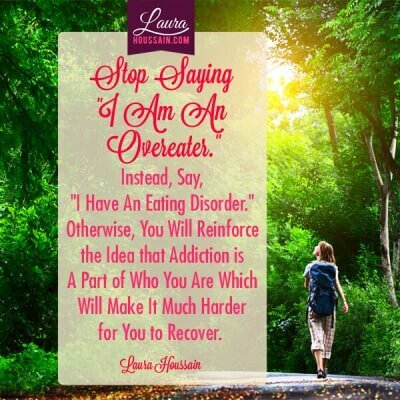 So what do you think you are doing each and every time you stigmatize yourself with “I am a food addict,” “I am a compulsive overeater,” or “I am a binge eater”? You are actually reinforcing that addiction each time you say it. Once you’ve accepted that you had an eating disorder, stop saying it! You may say “I currently suffer from food addiction,” but I still feel that is not benefiting you. Now that you’ve moved past denial, all you must focus on is the person you want to become—not the person you currently are. You may think that saying “I am a recovering addict” is a great idea. I still think it’s not, because it keeps you mentally attached to the image of an addict. A recovering addict is still an addict. In my program or workbook, I teach you how to set a clear and powerful intention to become the person you want to be. It’s using the same techniques that athletes use to win a gold medal. To me, focusing on the person you want to be, a person who eats normally, is vital to your success. I think in that aspect a twelve step program is really counter-productive as a treatment for binge eating disorder. Going through this program several times may actually foster more shame by keeping you focused on everything you do wrong. A better approach is to focus on how great you will be when you have recovered, how proud and empowered you will feel; so keep that image in front of you at all times. Maybe you’ll become a better parent, a better partner. Maybe you’ll have enough empathy for yourself to stop hiding. I know several techniques that can imprint this new image of yourself in your mind quickly and make it become your new reality. I think the most important step in the twelve step programs is to know when to quit. I don’t care what people in these programs say, they should not last forever. First, if you want to quit, you must develop your own set of coping skills beyond these programs. You must learn ways to give yourself support and love outside the group. You don’t want to feel like you have a limp leg and need to walk with crutches for the rest of your days. This is not where your personal power and self-esteem stems from. My workbook, 12 Minute Binge Eating Busters, can help you develop strategies you can use on your own to stop binge eating super fast. What you ultimately want is to move away from shame, learn to relieve stress, and stay focused primarily on what you want. In other words, use the support groups if you will, but learn to become autonomous as quickly as possible. Once you have made amends and learned how you defeat yourself with your addiction, how much addiction hurts you, and how to listen with empathy, leave the program! You can always come back later if needed, but once you’ve stopped binge eating for a while, leave. Reinforce the message to yourself that you can depend on yourself. At some point, you should expect tangible results. After several months in the Love Addicts Anonymous program, I felt those results were never going to come. I wanted something that I could depend on each and every day, something quick that I could rely on when nobody was around. That’s what I’ve found with the techniques I share with you in my method. Learn them, make them yours, and if you still feel the need to attend a support group, please do. Just expect to feel a bit like a stranger in the group after a while. I know, because it happened to me. At some point you won’t be able to see yourself as the guilty victim of an addiction you can’t control. You will have gained a lot of your personal power back, and you will realize that you don’t have to do all that stuff to get over your addiction. It just won’t make sense anymore because you’ll know, deep inside, that you can learn to eat healthy again, and that it’s not that hard. In other words, you won’t be a slave to your addiction anymore. You won’t be able to stand up and say “I’m a binge eater” or “I’m an overeater” anymore without knowing inside that it’s not really true. You will know how to avoid binge eating triggers or react appropriately to them. You won’t need to fight or struggle any longer; you will simply be you. Someone who can quiet your binge eating monster in twelve minutes—not twelve very long steps that you have to repeat over and over. Please share your experience and comments below. I went to OA for over a year. It was very healthy for me to face my compulsive eating and call it by name. But as I began to heal, it didn’t sit well with me to keep saying, “I am an overeater.” I wanted to move on, because food issues weren’t my focal point anymore. Also, to be considered “abstinent” in OA, at that time at least, was to eat three meals a day, no snacks. But my biggest trigger for food obsession was trying to follow an eating plan, and wanting to do it perfectly. I did best when I didn’t focus over much on food and tuned into my body. So the “rules” of recovery were a trigger for me. Over the years I felt less and less like I had an eating compulsion, though there were times I over ate and regretted it, I maintained a normal weight without dieting, (though not the low target weight that was my ideal goal during the dieting years.) I dieted so much from the age of 12 to 23 that I think that is why I have very little will power now for eating plans. It’s like a wound. After passing 50 I’ve had health issues that are helped by eating lighter and staying away from dairy, gluten and sugar. But this has triggered some of my old issues, which is why I was searching and came across this website. Especially reading about anti candida diets which label a lot of foods as bad, and whittle down the acceptable list of foods to vegetables, organic meat and occasional fruit. I’ve been wondering why I’m so triggered and struggling with cravings and overeating. I had forgotten the world of dieting that I came from. I feel a little more sane after reading this. I have felt bad and crazy for craving sweets and carbs. But it’s the rules themselves that triggered me. I wrote my own rules tonight. That felt good. Thank you, Lis, for your comment! I love it. Yes. There’s a point when you get better and saying “I’m a compulsive eater” doesn’t resonate with you anymore. I’m glad you got out of that trap. If it can reassure you, I can’t stand a meal plan more than 48 hours without obsessing on cookies, cakes and turning into carb zombie. I’m the biggest diet loser in a sense that I don’t have the nerves for it. It seems you had found some balance with food which is good. We do tend to overeat sometimes and that’s OK as long as we keep a good average. I totally get having cravings when you try to stop eating a certain type of food. You said you made your own rules. I think that’s good because it’s really tempting to disobey somebody else’s rules. May I suggest you make it your personal choice rather than a rule. In other words, remind yourself that you chose to do this because you love feeling good and healthy. This should make things easier for you. Much love and thank you again for a beautiful testimony of the power of trusting your own instincts and yourself. That's a great suggestion! My list of choices. I also need to write down WHY I choose to not eat certain foods, they make me sick! But I tend to forget, lol. To work all 12 steps is important. Thank you for your comment Chris. It would be nice if we could hear your opinion on why you feel it is important to complete all twelve steps. I certainly would like to hear it. You know that I don’t feel it’s the case for everyone. That certainly was not the case for me. It’s what they tell you and I respect that because I know it has benefited several people. But I believe there are several paths to recovery and I found one that suited me better. I know I’m not the only one who got turned off by having to say I’m an addict during the recovery phase. It was good at first to acknowledge it but I found it counter-productive after a while. How can you say you’re one thing and focus on becoming another? I find it a very difficult and unnecessary exercise. 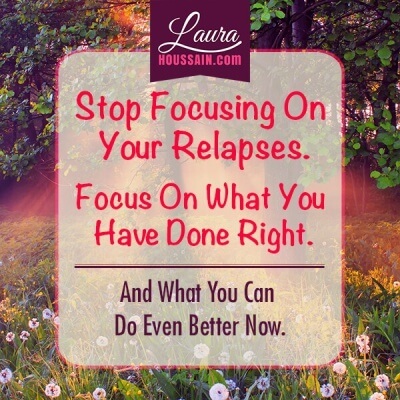 It’s one thing to say that you’re always at risk of a relapse and another to say you will always relapse. When you say you are an addict. You say you will relapse because of what you are. Oh wow. I just had a break through. I can’t wait to see what the next thirty days of the effect of thinking saying and believing that “I love food and I love to feel good” has on me. You just made me realize what I think of myself. I won’t embrace that thought anymore. I’m not addicted to sugar even if I was yesterday. I’m focusing on tomorrow. I’m taking steps to love myself better. And I’ve been up since 3am reading your articles and equipping myself with those very steps. I woke from a deep sleep around 3 am with a strong leading to search ‘how I finally quit sugar’. I landed on your site read your articles and now I will take a nap. Wish me well. I’m trying you in for thirty days. I’m delighted that you’ve found my blog and that it inspired you to have a breakthrough. It’s good that you have decided to open to the possibility of change and to no longer make addiction your identity. Explaining something is keeping it real, so I’m glad you gave up explaining why you had candida as well. I have one warning though. Addiction uses denial and justification to keep itself going. So, it’s a bit tricky. You have to acknowledge that recovery is possible and already occurring while being brutally honest about your behavior and thoughts. Brutal honesty + loving awareness of what you do and say to yourself will get you to “the other side,” the place where sugar is OK but doesn’t make your day.